Accessible 4K video shooting is still in its infancy, but it was only a matter of time before it started showing up in consumer cameras. The Panasonic GH line's history of robust video capability makes it a natural fit for 4K, and the new Lumix GH4 squeezes as much as it can into a familiar frame. While 4K video is the marquee feature, the GH4 is a more than capable still camera as well, with upgrades to nearly every major component of 2012's GH3. A new 16 megapixel micro four-thirds sensor matches the resolution of it's predecessor, though Panasonic is promising increased image quality. Though the difference may not be huge, the major advantage of the new sensor is its faster readout rate, meaning reduced rolling shutter jello effect. The processor is also an upgrade—a Venus 9 engine in place of the GH3's Venus 7. This means increased speed and more effective processing. Other upgrades include a 1/8000 second maximum shutter speed, 1/250 flash sync speed, and a 12 fps burst mode. The GH3 was no slouch in autofocus speed, but a new focusing tech, dubbed DFD (depth from defocus), promises snappier autofocus by actually measuring the bokeh and using lens data to determine focus distance. Unfortunately the new system only works with Panasonic's own lenses. The GH4's weather-sealed body looks much the same as the GH3, but almost every aspect inside has been improved. The OLED touch-screen display has been upgraded to 1.04 million dots, and the EVF is now a 2.36 million dot OLED, matching Panasonic's GX7 as well as recent cameras from Sony and Olympus. All-in-all, on the stills side, you've got one superbly spec'd camera with some hearty upgrades from the GH3. The big step forward, however, is on the video side. 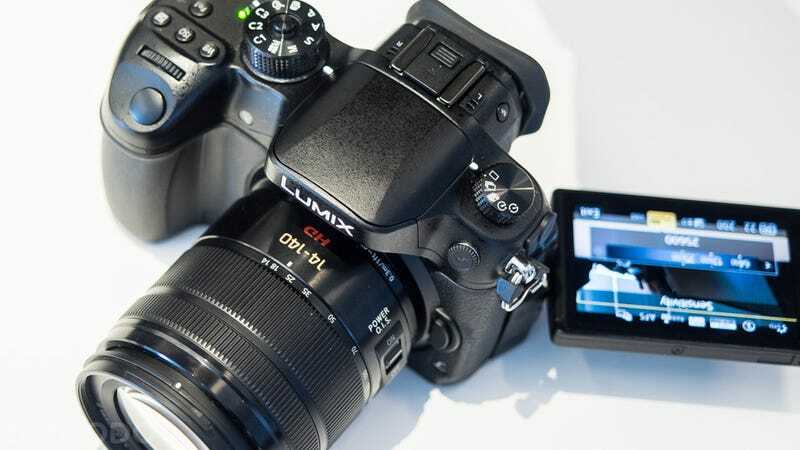 The GH2 and GH3 became darlings of the video community because of Panasonic's willingness to include a strong set of features aimed at making video shooting front and center, as opposed to an afterthought jammed into a still camera. This time around, the addition of 4K is what's meant to turn heads. It's an outstanding feature, no doubt, but not without its compromises. To record 4k video with the GH4, you will need to go one of two routes. First, you can purchase Panasonic's brand-new type of SD card with a ultra high-speed class of 30 megabytes per second; this will let you record 30p or 24p 4k video in-camera with IPB compression at 100 Mbps with a 4:2:0 8-bit color space in either a MOV or MP4 wrapper. That's a mouthful of a video spec, and what it amounts to is highly compressed 4k which could effect image quality, eve though it is in line with the competition like Sony's AX100 Handycam. When briefed by Panasonic, we viewed a couple of quick clips taken with the GH4 on a 65" 4K TV. It looked pretty good, but it wasn't enough to make a useful evaluation. The other option, for a cleaner recording that will stand up to color-grading better, is to hook up the camera to an external recorder. You can do this via HDMI for 4:2:2 8-bit footage, or you can attach Panasonic's burly new interface attachment. This thing looks like a battery grip on steroids. The attachment features some very professional inputs and outputs: XLR audio, 3G-SDI outputs with timecode, 12-volt DC input, and audio level monitors. With the interface unit plugged into an external recorder, the GH4 can output 4k in 4:2:2 10-bit color space. This beefy setup won't suit run and gun handholding. It is much more practical in production environments. Despite the allure of 4k resolution, many shooters won't feel the need to make the jump just yet. For them, the GH4 provides some stellar full HD recording options. Using the new UHS SD cards, you can record 24p or 30p video with All-I compression at a whopping 200 Mbps. A standard Class 10 SD card will give you 80 Mbps, the same as the GH3, with a variable frame rate mode that will yield in-camera slow motion up to 96 fps. Overall, the Lumix GH4 certainly packs some impressive guts. On the still side, it will compete with other high-end micro four-thirds cameras like the Olympus OM-D E-M1 as well as APS-C systems like Fujifilm's X series. Micro four-thirds still draws plenty of appeal with its large lens ecosystem and compact size. But you can bet on most of the GH4's buyers being video shooters in some capacity. It's not yet known if most will feel the urgency to shoot 4K for another couple of years since most people still don't yet have 4K TVs or monitors. But Panasonic is smart to get out ahead of the competition in this area, and by incorporating a truly professional system in its new interface unit, the company is signaling that it takes the high end seriously. The question is whether professionals will see enough reason to invest in the GH4 with such a highly compressed 4K spec. For non-pros, it'll come down to price. Popular rumor has it that the GH4 will come in just under $2000, but Panasonic hasn't announced that detail quite yet. We should know the specifics next month. If that price-point becomes a reality, the GH4 could be an attractive option for high quality video, with or without the 4K.